The Air Force has changed the way they develop young men and women into Air Force members, emphasizing war-fighting and remote deployment skills much more than they have in years past. The physical fitness standards are harder than previous decades. Greater emphasis on weapons training and classroom training is focused on combat-related skills such as first aid "buddy care," and chemical/biological weapons defense. A real and active threat during deployments determines the changes from just military transition to training a military at war. In November of 2008, the Air Force changed the length of AFBMT. Training was expanded from 6½ weeks to 8½ weeks. In 2015, the Air Force again made changes to AFBMT schedule. Recruits will march in the graduation parade at the 7½ week mark — one week earlier than trainees traditionally have. But instead of heading off to technical training afterward, they'll return to AFBMT for the capstone (transition) week, when they'll cover in detail topics such as ethical decision making, wingmanship, resiliency, respect and sexual assault prevention and response. The Air Force only has one location for enlisted basic training: the 737th Training Group, at Lackland Air Force Base, in San Antonio, Texas. It doesn't matter if you're joining the active duty Air Force, the Air Force Reserves, or the Air National Guard. All new Air Force recruits go through the same basic training at Lackland. Each year, over 35,000 new recruits go through AFBMT. The new AFBMT is not only designed to teach the fundamentals of military life but also places great emphasis on the Air Force Expeditionary Force (AEF) deployment cycle, which consists of pre-deployment, deployment and post-deployment phases. There are many things you can do to prepare yourself for upcoming challenges both mental and physical. For instance, learning military time, chain of command, and more advanced study. Working out 5-6 days a week with running, backpacking, and calisthenics should be done at least 4-6 months prior to be fully prepared for the physical challenges. Going to training in shape will prevent you from failing events or likely injuring yourself due to being not accustomed to long days of work and physical effort. Getting in Shape is important but also knowing what to Tell Your Family about your training and what to Pack when you leave for Week Zero. Week Zero - Processing Week - This week is all about the basics. You will receive a haircut, get issued your clothes, and learn what your life will be like the following 8 weeks. Basically, this week is an administrative week. Week One - You start training this week with early wake-ups, workouts, and long days. You will continue a few of the military processing issues and tests (medical/dental). Expect to be tired after long days of military training. Week Two - You will continue regular workouts and many hours of drill (marching with weapons) as they get tougher than previous weeks and attend a significant number of classes on many topics. From career counseling to weapon handling and maintenance to Air Force History, you will receive a full day of training every day. Week Three - You receive your service dress uniform complete with an all-weather coat, a lightweight jacket, ties, a flight cap, belt and buckle, and low-quarter shoes. Be prepared to quickly get dressed in and out of all uniforms. Week Four - Tactical training continues and advances as you will start to learn defensive fighting techniques like cover and concealment, as well as lifesaving skills (advanced first aid). Learning to prevent bleeding and keep an open airway are a couple of the skills you will learn that might save a life. Week Five - BEAST Week. This week is a challenge both mentally and physically enduring long hours of physical training, combatives, and tactical skills tests. Some will recall this as the most fun week of training. Being physically prepared enables you to enjoy this week of applying skills you have learned the first month of training. Week Six - Testing Week: You will be tested often during training, but this is the week where the PT test, academic tests, and general military bearing all come into question and an objective grade will be given to recruits. This week will determine your class ranking and awards given at the end of training. Week Seven - Graduation Week. Welcome to the Air Force. 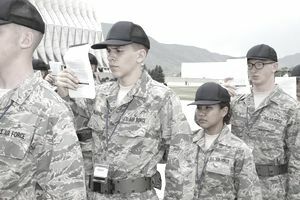 Week Eight - Airmen's Week: This is the final step before the new Airmen advance to their assigned technical training. Workout 5-6 days a week, but also work the rest of the day doing things. Whether you have a full-time job or you keep yourself moving all day a few months prior this activity will help you be able to handle long days of physical, classroom, and work activity.